1In a large heavy skillet, heat the oil and butter over medium-high heat. Add onion and cook, stirring often, for about 10 minutes or until golden. Add garlic, tomato paste, garam masala, ginger and cinnamon and cook, stirring constantly, for 1 minute. Stir in diced tomatoes, scraping any brown bits from the bottom of the pan; cook, stirring often for 5 to 10 minutes or until most of the liquid has been absorbed and sauce is thick. Whisk in cream until smooth and well combined; simmer for about 3 minutes or until slightly thickened. Stir in chicken. Remove from heat and set aside. 2Preheat barbecue grill to medium heat. 3On a lightly floured surface, stretch or roll dough into two thin rounds and bring them out to the grill on a cookie sheet or cutting board. Flip dough, oiled side down onto preheated grill. Grill, covered, for 3 to 6 minutes or until bubbles form on top and grill marked underneath without charring. 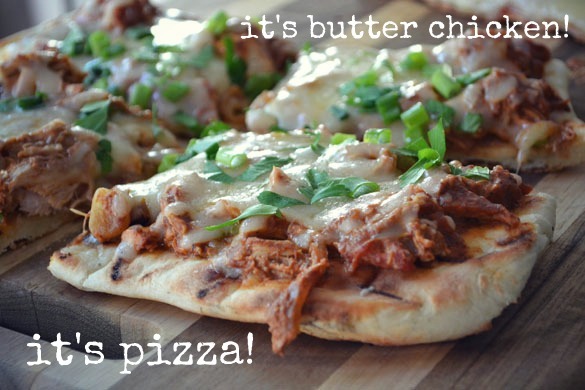 Flip over; spread butter chicken evenly all over each pizza. Sprinkle with cheese and green onions. Slide back onto grill, cover and grill for 3 to 8 minutes or until the cheese is melted and bubbly and underside is browned. Sprinkle with cilantro before serving.